Johnny Ellis. 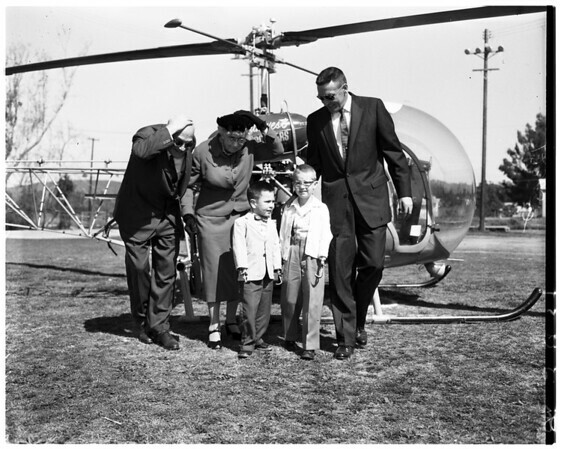 208: School children watch as pilot Roy Bourgeois gives Mrs. Nixon, Timmy Fenner, Johnny Ellis helicopter ride. 215-216: Don Belding (at left) with Mrs. Frank Nixon, Timmy Fenner and Johnny Ellis in helicopter. 204: Mrs. Frank Nixon in room where vice-president was born. 209: Mrs. Frank Nixon (with Mrs. Virginia Waldron House -- whose bedroom it was until recently) in room where vice president was born".